I've loved being part of Page 73's Interstate 73 Playwriting Workshop this year, and am delighted that they are sponsoring a reading of my play "Song of Extinction." We have an incredible director (Carolyn Cantor, who just directed "The Great God Pan" at Playwrights Horizons), and some fantastic actors, including Francis Jue as Khim Phan and Reed Birney as Ellery Forrestal. Hope to see you there, friends! Details below. Join us for Page 73's first Interstate 73 reading of 2013! Featuring Francis Jue as Khim Phan, Ephraim Birney as Max Forrestal, Reed Birney as Ellery Forrestal, Curzon Dobell as Gill Morris, Enid Graham as Lily Forrestal, and Jonathan Hova as Joshua Dorsey. 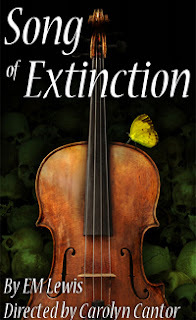 In "Song of Extinction," Max, a musically gifted high school student, is falling off the edge of the world — and his biology teacher is the only one who’s noticed. A play about the science of life and loss, the relationships between fathers and sons, Cambodian fields, Bolivian rainforests and redemption. Winner of the Harold and Mimi Steinberg/ATCA New Play Award and the Ted Schmitt Award for the world premiere of an Outstanding New Play from the Los Angeles Drama Critics Circle.